Blake Edwards, a writer-director whose "Pink Panther" comedies with Peter Sellers earned him a reputation as a master of sophisticated slapstick comedy and whose legendary disputes with studio chiefs inspired his scathing Hollywood satire "S.O.B.," has died. He was 88. 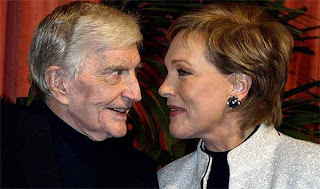 Edwards, whose collaborations with his wife, Julie Andrews, included the 1982 comedy "Victor/Victoria," died of complications of pneumonia Wednesday evening at St. John's Health Center in Santa Monica, said Gene Schwam, Edwards' longtime publicist. Andrews and members of the immediate family were at his bedside. A onetime minor movie actor who began writing for films and radio in the late 1940s and a decade later created the TV series "Peter Gunn" and "Mr. Lucky," Edwards launched his big-screen directing career in 1955. He scored his first box-office hit with "Operation Petticoat," a 1959 comedy about a World War II submarine crew starring Cary Grant and Tony Curtis. But a turning point in Edwards' film career came in 1961 with "Breakfast at Tiffany's." The light, sophisticated romantic comedy based on the Truman Capote novella earned Audrey Hepburn an Academy Award nomination for best actress. Composer Henry Mancini also won an Oscar for his score, and he and Johnny Mercer won Oscars for their memorable song "Moon River."